Love it or hate it, Snapchat is a major social network, so it’s only natural that you’d want to advertise effectively on this prominent platform. But how do you do it? And what form of ads should you use? And when you’ve answered both of those questions, how do you ensure that you get the best possible audience reach? 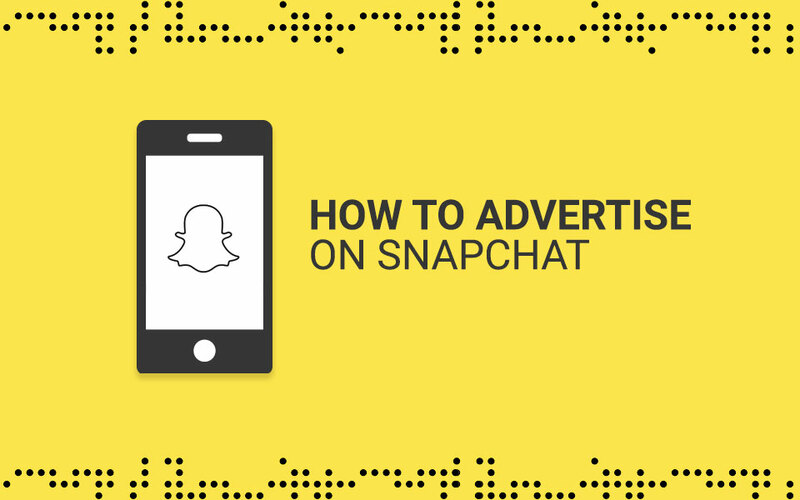 Well, we’re here to help with answer all of the above, so without further ado here is our guide: How To Advertise on Snapchat. Snap Ads are videos of up to 10 seconds which can have a swipe up link, connecting consumers to a targeted product, or landing page of your choice. If you have knowledge of Instagram stories and feel like examining the old argument of similarities between Snapchat and Instagram, this is the easiest place to find evidence for comparison. We’ll come onto how these adverts are targeted later, for now, this is all you need to know. Lenses are what Snapchat are best known for right now, if you haven’t seen a snap of someone shaking puppy ears, or vomiting a rainbow, consider yourself lucky. A Sponsored Lens is a (usually) interactive overlay which interacts with the users’ face. So, what lens would you give to encapsulate your brand? Well, the choices are endless and you know your brand better than anyone else, so this is up to you. Sponsored geofilters do pretty much what they say on the tin — they’re sponsored adverts with your branding which are tied to a specific location. They are typically banners which appear either at the top or bottom of the user’s screen and typically have artwork or the skyline of your chosen location. But, a location can vary from a single shop or site all the way up to an entire country and the prices change to go with this, so the choice is yours. Just remember that the bigger the area covered by your Sponsored Geofilter, the higher the monetary cost to you. These are your entry level Snapchat ads, and notably, the only ones you can purchase, sort out, and post to the Snapchat network yourself. Like Sponsored Geofilters these adverts are tied to a fixed location. But, these filters are low commitment by comparison and only require time commitments as short as 1 hour and as small a location as a 100 metre square. This is coupled with prices starting from as low as $5 and you start to understand how this format can be perfect for traditional stores or special event promotions. The joy of Snapchat is how interactive it is, gone are the days where its only function was as a disappearing photo messenger. Nowadays, it is primarily used as a sharing platform to temporarily document you or your brand’s life. This isn’t just confined to the app though, there’s now a growing interest in Snap To Unlock, which combines the physical world with the digital realm of Snapchat. By taking a photo of a Snap To Unlock code using the camera in the app, users are able to access ‘secret’ extra links. These are things such as landing pages and products that can’t be accessed another way. This degree of exclusivity and/or secrecy ensures that your potential customers will be very inquisitive about your products. But you should consider the flipside that without tag-lines or instructions to snap the code, you could miss out on a number of potential customers. Work directly with Snapchat, their advertising team are happy to help you create your ideal product. The biggest lure to work with Snapchat directly is knowing that you’re working with the same team who have created Snapchat’s own adverts, filters and lenses. If that’s not enough social proof, I don’t know what is. Ads Partners help you create Sponsored Geofilters and Sponsored Lenses. Creative Partners specialise in creating Snap Ads, be them a single one, or a series. Now, no matter what you decide to do, there’s no getting around the cost factor, a February 2017 analysis showed an average cost of between $40 and $60 for every 1000 impressions. But, Snapchat have recently introduced a goal based bidding system which could prove more cost effective. Because, instead of charging by the impressions, which may or may not prove effective, you only pay for the clicks through to your site. Finally, we come on to Ad Targeting. After all, there’s almost no point showing a hair loss shampoo designed for older men to a 14 year old girl. So, how is it done? There are 3 ways to target your Snapchat advert to make sure it reaches your ideal consumer, and each of these comes with their own advantages and disadvantages. To keep things clear for you, we’ve included a big pro and con that each targeting system comes into contact with. This is done through matching email and mobile device IDs to target users through their device IDs, postulating age and gender to target your biggest likely audience. Pro: This is the most generalised advertising option, and will reach the widest possible audience. Con: This is the most generalised option, there’s less active targeting, so your audience may be bigger, but not necessarily interested in your product or service. Pro: This is the middle ground in terms of advertising on Snapchat, and able to reach a larger number of potential customers with similar interests in products such as yours. Con: This route isn’t as specifically targeted as the Lookalike targeting system which is outlined below, so there’s no guarantee that all of the people who view your advert are interested in your service. If you want to be likened to another brand, this is possibly the best way to go, because your audience will be made up of customers of similar brands. This is the most specific method of targeting that is available to you on Snapchat. Pro: You know they have been interested in a similar product beforehand. Con: This method reaches the smallest number of people, so you’re less likely to build a new and different client base to your existing one.